NTK Marine VanDutch is pleased to inform you of their participation to the event exhibition the most anticipated of the French Riviera to be held on 25 and 26 March 2015 at the Palais des Festivals in Cannes. Heavent Meetings is a business show dedicated to event venues, hotels, and technical services providers aims to encourage direct encounter between “Top Decision Makers” and exhibitors through appointments. This exhibition is an effective commercial leverage for the development of the activity of each exhibitor. Heavent Meetings invited to the 2015 event, 430 Top Europeans Decision Makers (mainly coming from France, Germany, England, Switzerland, Belgium, Italy and Austria) who come to meet services providers of the region and its surroundings. 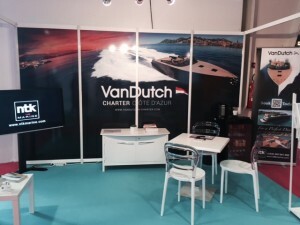 NTK Marine VanDutch will exhibit at Heavent Meetings Cannes to offer VanDutch yacht available on charter: the VanDutch 30, the VanDutch 40 and the VanDutch 55 for organizing events on the French Riviera. NTK Marine VanDutch will be very present during the exhibition with its stand on which members of the company will receive Top Decision Makers and other visitors, its involvement in organized business lunches and also through participation in two nights of Gala-Cocktail dinner. Heavent Meetings became the leading event for Event and MICE (Meeting Incentive Congress Expo / Events).